Even if you work in a casual dress code environment or a business casual work environment, the rules may change when you hit the road for your company with a business mission. Whether you are exhibiting at a trade show, attending a conference or training session, or visiting a customer, the dress code in effect at your office may change for travel and meeting customers. Especially if your company allows employees to dress casually for work, this is usually a way too casual look to take on the road. Another approach to dressing business casual at events is to ask each member of the exhibiting team to wear the same company logoed shirt and the same color of pants or slacks. This has the advantage of helping customers know immediately who is available to help them and presents a professional image and appearance to the crowd. Take a look at this sample dress code for guidance about how employees should dress for business travel and customer interaction. While the office setting can be casual because customers don't visit, traveling to see customers, exhibiting at or attending trade shows, and representing the company in the business community, requires different decisions about attire. Business casual dress is the minimum standard that must be observed when you are representing the company or interacting with customers or potential customers. Before visiting a customer or potential customer ascertain the accepted dress code in their organization and match it in your attire. While your business workplace may dress casually or in business casual clothing, workplaces differ across the country and by industry. For example, the norm in financial services, banking, law firms, and management consulting is likely business formal. You will minimally want to wear a sports coat, a nice dress or a suit if you are working in these fields. This is especially important when you are traveling globally representing the company, as customs and dress in other countries may differ from those observed in the United States. Dressing the same way as the customer or client you visit helps create the relationship you want to foster with the client to meet your business needs. Additionally, some community events, when you are representing the company, might require formal dress. These events might include the Chamber of Commerce and other civic or business development meetings, luncheons, and dinners. Take your cue from other employees who have attended and be observant at the event. Certainly, if you are a speaker at a business event, consider wearing formal dress. Finally, on the occasions when a customer or a business partner does visit the office, the employee groups with whom the visitor is interacting, should adhere to business casual standards. No dress code can cover all contingencies so employees must exert a certain amount of judgment in their choice of clothing to wear when traveling and visiting customers. If you experience uncertainty about acceptable attire for work, please ask your supervisor or your Human Resources staff. Your contacts at the client are another source for business attire information. If clothing fails to meet these standards, as determined by the employee's supervisor and Human Resources staff, the employee will be asked not to wear the inappropriate item to a trade show or customer location again. On a second offense, you may want to ask the employee to leave the event. If the problem persists, you need to employ disciplinary action. This should start with the employee receiving a verbal warning for the first offense. All other policies about personal time use will apply. Progressive disciplinary action will be applied, up to and including employment termination, if the dress code violations continue after the employee has been counseled. 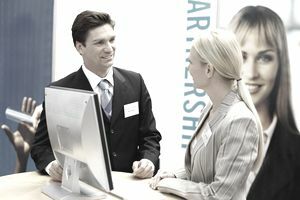 Finally, if the employee's core job requires that he or she visit with customers and attend and interact at trade shows, employment termination may become your only option. You don't want to employ an individual who does not represent your company in the way you want your company represented. Your image must matter to you - it does to your customers.